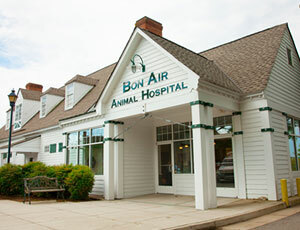 Bon Air Animal Hospital is a multi-faceted animal care facility which combines the highest quality of medicine and surgery with a compassionate and knowledgeable team for patients in Richmond, Midlothian, and Chesterfield. Our primary goal is to maintain the maximum quality of life for our patients through disease prevention, treatment, and client education. All of our employees, from kennel workers to doctors, assist in conveying this quality of care with their passion and love for animals. We believe that excellent customer care stems from not only how we treat our clients, but how we treat their pets, striving to create the most comfortable environment possible while they are in our care. We see small animals, including dogs, cats, pet pigs, and chickens. In our hospital we offer an open-door policy during business hours for hospitalized patients, allowing owners to visit with their pets to help facilitate their recovery. This, teamed with a clean and welcoming environment, maintains the high quality of service that our clients have come to expect.